Spread small amount of anesthetic on the desired skin area and cover it with nutritious film for 15 minutes. Keep it in a cool and dry place.Ingredients: Tetracain 19%, Lidocaine 4%, Benzocaine 19%www.skinmonarch.com/shop.. Skin Monarch Anesthetic gel 30ml. For Use by Licensed Professionals Only.During procedure, for eyeliner, brows, lips This product contains Tetracain 19%, Lidocaine 4%, Benzocaine 19% which reduces swelling, bruising and bleeding. FOR EXTERNAL USE ONLY: WARNING: Avoid direct contact with the eyeball. If contact should occur, irrigate with cop.. 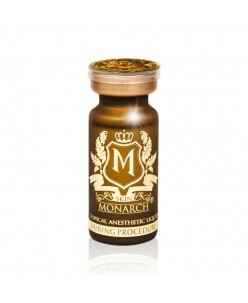 Skin Monarch crystalized anesthetic (10 ml. )Skin Monarch crystal effectively reduces discomfort before permanent make up procedure and during procedure. Used for lips and eyebrows procedures. Before using put for 1 minute into warm water until product will be liquid. Use: Spread a few drops on the desired area of skin.. Skin Monarch liquid anesthetic formula (10 ml. )Skin Monarch liquid anesthetic formula effectively reduces discomfort before permanent make up procedure and during procedure. Formula with epinephrine stops swelling and bleeding during procedures. Used for lips and eyebrows procedures. Before using put for 1 mi..